If you want to know the one thing that makes Arctic Cat ATVs great, it’s everything — everything working together in perfect harmony. From the riding position to engine power to ground clearance and suspension travel, Arctic Cat riders around the world covet their wheelers for the freedom and abilities their wheelers give them. 700 H1 4-Stroke Engine w/EFI It's all about power and torque. The 700 H1 is a 695cc, liquid-cooled single-cylinder with EFI. Along with being a cleaner-burning, more efficient engine, the H1 delivers excellent throttle response and superior thermal efficiency. Ride-In Suspension With a lower seating profile and improved ergonomics, our Ride-In suspension delivers sharper cornering without sacrificing ground clearance or suspension travel. Double A-arms optimize wheel motion translating into more responsive steering and better cornering. Power Sport Digital Gauge This digital gauge features all the essential operation information indicators: RPMs, speedometer, trip mileage, gear indicator, digital clock and fuel indicator. Duro 3 Star Kaden Tires with Aluminum Wheels A solid, all-terrain tire, the Duro 3 Star Kaden is a smooth-riding tire with excellent grip, boasting a 3-ply rating. Camo models come standard with powder-coated steel wheels. Electronic Power Steering (EPS) It’s all about managing steering torque. Forces are measured electronically both at the handlebar and at the wheels. The ECU calculates resistance as it relates to speed. The power steering motor responds faster than you can blink. 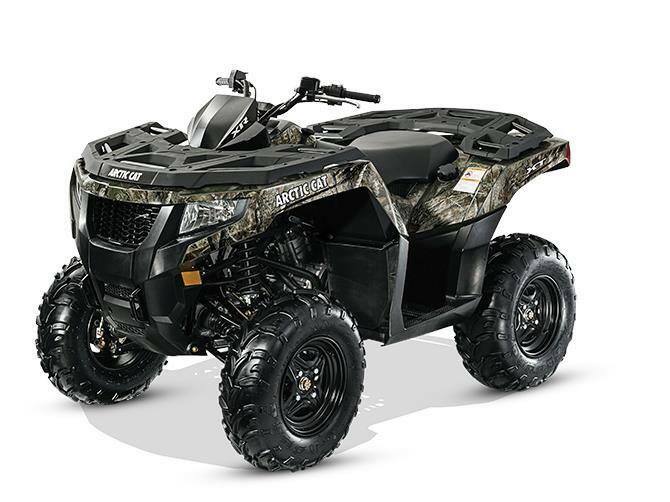 Arctic Cat EPS will make you the master of slow-speed maneuvers. Dual Halogen with LED Accent Headlights These halogen headlamps are no slouch when it comes to lighting your way home. Teamed up with the LED light bar, the darkness won't last long after this one-two punch. Dual Rear LED Taillights These LED taillights are not only bright, they will give people riding those other brands something cool to look at. Large 1.44 Gallon Water-Resistant Rear Storage Compartment No one ever complained of too much storage. This 1.44 gallon rear storage compartment is a much-appreciated addition. Plus, it’s water-resistant. Front and Rear SpeedRack II New in 2015, Arctic Cat’s famed SpeedRack® II system is now constructed from high-grade plastic with reinforced steel underneath. The TPE rubber coating keeps objects from sliding around. Rated for 100 lbs. carrying capacity on the front and 200 lbs. on the rear. 2/4 WD with Electric Front Differential Lock When the going gets aggressive, flip a switch and you're in 4WD. For maximum traction, lock the front differential. Double A-Arm / 10 in. Front / Rear Rack Capacity 100 / 200 lbs.